The U.S. Government started investing in algal biofuels in 1978. They’re still trying. The Aquatic Species Program was launched in 1978 by president Jimmy Carter to explore the potential of algae as an energy source. About $25 million was put into the program until it was shelved by the Clinton administration in 1996. They never found the 'lipid trigger' -- the trick to making the organisms produce lipids capable of being turned into biofuels in a high-volume low cost manner. Since then, scores of firms, startups, and Fortune 500 companies alike have worked on algae-based biofuels. Hundreds of millions of dollars have been invested. So far, maybe a few thousand gallons of very expensive algae oil have been produced. The algae oil hype machine has slowed a bit, even as the concept of algal biofuels has slimed its way into the public consciousness. Still, at the moment, the only people making money in the algae biofuels business are artists doing graphic renderings of what algae plants might someday look like. 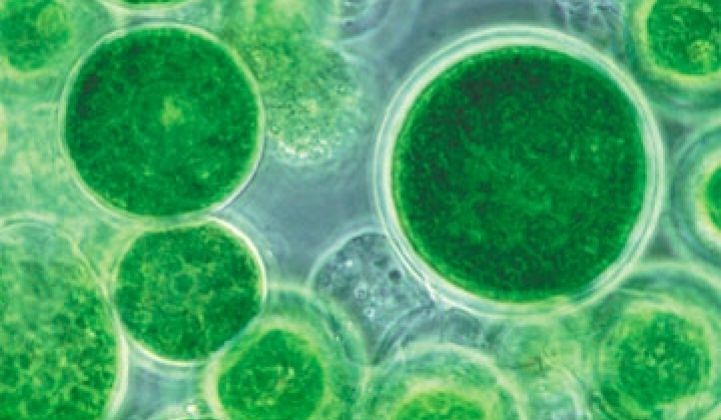 The question remains: can algae be economically cultivated and commercially scaled to make a material contribution to the world's liquid fuel needs? The jury is still out. GTM Research has authored a report on algae and next generation biofuels -- learn more here. On paper, algae is perhaps the perfect feedstock for biofuels. It grows in a wide variety of climates. It looks to have lower water intensity than corn or cellulosic ethanols. It might be able to mitigate carbon dioxide. The liquid fuels produced by these single-celled creatures are only one of their byproducts, and potentially not even the most valuable. Cosmetic supplements, nutraceuticals, pet food additives, animal feed, and specialty oils for human consumption could win higher per-gallon prices. The allure of algae is that some species contain up to 40 percent lipids by weight. And therefore, according to some sources, an acre of algae could yield 5,000 to 10,000 gallons of oil a year, making algae far more productive than soy (50 gallons per acre), rapeseed (110 to 145 gallons), mustard (140 gallons), jatropha (175 gallons), palm (650 gallons), or cellulosic ethanol from poplars (2,700 gallons). But that allure runs into the hard wall of reality as algaepreneurs learn to deal with identifying or creating the right species, growing the algae without contamination or predation, and dealing with the difficulties of de-watering and oil extraction. Each of those process steps have yet to be mastered -- beware of claims to the contrary. Last week, the U.S. Department of Energy (DOE) announced the investment of up to $24 million for three research groups to tackle key hurdles in the commercialization of algae-based biofuels. The funded groups consist of partners from academia, national labs and private industry that are based across the country, with projects expected to continue for a period of three years. Sustainable Algal Biofuels Consortium (Mesa, Arizona): Led by Arizona State University, this consortium will focus on testing the acceptability of algal biofuels as replacements for petroleum-based fuels. Tasks include investigating biochemical conversion of algae to fuels and products, and analyzing physical chemistry properties of algal fuels and fuel intermediates (DOE share: up to $6 million). Consortium for Algal Biofuels Commercialization (San Diego, California): Led by the University of California, San Diego, this consortium will concentrate on developing algae as a robust biofuels feedstock. Tasks include investigating new approaches for algal crop protection, algal nutrient utilization and recycling, and developing genetic tools (DOE funding: up to $9 million). In addition to the $9 million in federal funds, a group of seven companies -- including Sapphire Energy, General Atomics, and Sempra Energy -- are providing $3 million to finance an R&D effort. Cellana, LLC Consortium (Kailua-Kona, Hawaii): Led by Cellana (a joint venture between Shell and HR BioPetroleum), this consortium will examine large-scale production of fuels and feed from microalgae grown in seawater. Tasks include integrating new algal harvesting technologies with pilot-scale cultivation test beds, and developing marine microalgae as animal feed for the aquaculture industry (DOE funding: up to $9 million). The DOE recently released the final National Algal Biofuels Technology Roadmap that is intended to guide future work and investments in algal biofuels. Here's a link to the report. "Keep expectations firmly rooted in reality. Very early on in this industry there were some rather overly ambitious claims about oil production on a gallon per acre per year basis. We know now that many of those predictions actually violated the first two laws of thermodynamics. Photosynthesis is simply not that efficient. So, keep expectations real. If you don’t do that, then the funding agencies and public will develop overly optimistic and unrealistic expectations about what this technology can deliver and when. Over promising and under delivering is never a good situation to be in."